On the afternoon of 22 November, I arrived at the Hobart CSIRO reception, fresh-faced, a little anxious, and eager to see what the next month at sea would bring. I was soon joined by an array of scientists and marine park managers from around Australia – plus one Kiwi – all eagerly anticipating the hands-on research opportunity provided by Investigator. Luggage and specialised scientific equipment in tow, we clambered onboard: many of us for the first time. We cast off from Hobart at 08:00 the next day, amid strong winds. 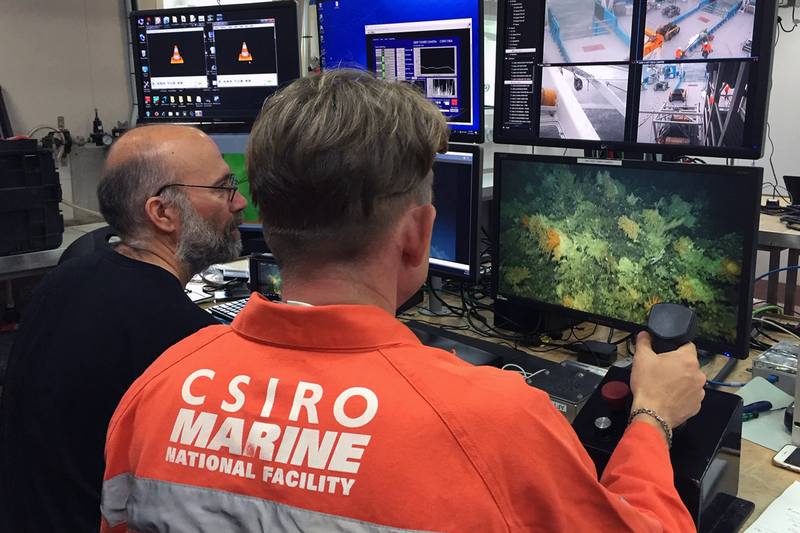 After steaming past an oil rig sitting in the middle of the Derwent River, we set out in earnest for the southern seamounts. Unfortunately, the rough sea and the motion of the ship did not agree with my stomach. Just after 10.00 the first bout of seasickness hit and I and several others spent the better part of the day lying in bed or in the bathroom. There were more challenges to come when videographer Andy Terhell and I filmed our first piece-to-camera on deck as Investigator pulled out of Hobart. I quickly learned we would need to adapt our methods of media collection to better suit the new environment. Within the first few minutes, the gear case and microphone cover had blown down the stairs, and the camera and tripod had toppled to the ground – either due to the wind or the motion of the vessel. We have since learned that gear is best setup inside, out of the wind, and that the camera and tripod must be manually stabilised at all times. So far, one of my highlights of the voyage has been spending time on the Monkey Bridge and on the fo’c’sle (the forward part of the ship’s upper deck) with the seabird and marine mammal observation team: Eric Woehler, Zara King and Alice Forrest. 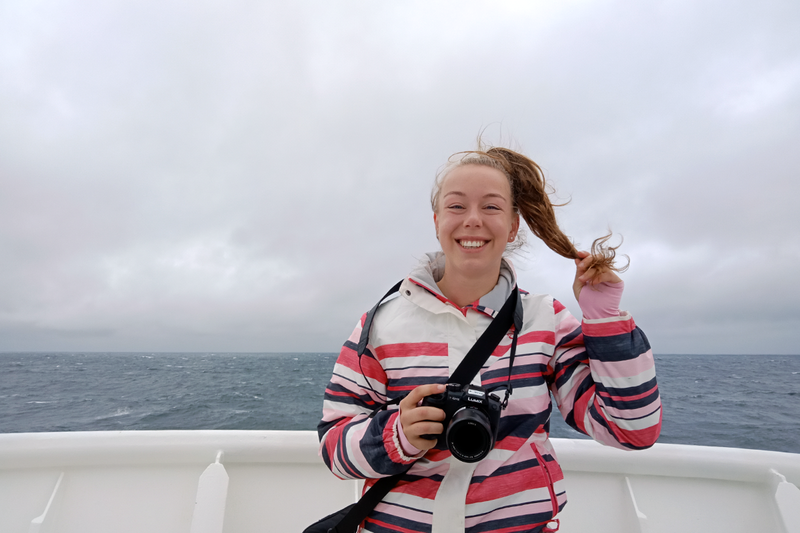 On Saturday morning, Eric, Alice and I spent half an hour with salt water and wind whipping across our faces, cameras poised to capture images of an unusually large collection of Southern Royal Albatross, Shy Albatross and Westland Petrels as they as they swooped, left to right, across the bow of the ship. Eric’s passion for seabirds is obvious, particularly in this environment – up close and personal with the birds – and his excitement inspires all those around him. The same goes for all the scientists onboard when they talk about their different areas of specialisation: their passion is catching. Despite a brief bout of seasickness, my first few days aboard Investigator have been jam-packed and exciting. I look forward to what the next few weeks will bring. A slow start to the day caused by some more teething problems on the cameras. The second shift starts at 2am, so that we can keep the ship operating 24 hours a day, and even that is barely enough to collect all the information that we would like. The slow start provided an opportunity for a second beam trawl, this time at a slightly shallower depth of 1000 metres, and some small fish were caught in addition to the invertebrates. The beam trawl also evidently encountered a largish rock on its travels, bending the metal beam. The beam is meant to bend when it encounters an obstacle, thus lifting the net over the obstacle without further damage. We carry spare metal beams on board, so it was quickly replaced. While the ship sits relatively stationary between transects it acts as a large bird aggregating device and we are frequently surrounded by up to 200 albatross of different species, soaring above the waves or settling on the water to socialise with one another. They do not seem fussed by the proximity of the ship, so the photographers on board are getting some excellent pictures of these magnificent birds interacting with one another as the ship drifts by. The three bird and mammal observers keep a constant watch from the observatory on deck seven (one higher than the wheelhouse and the highest deck on the ship). But my favourite spot is on the bow where it’s possible to get a better impression of the size of these birds. 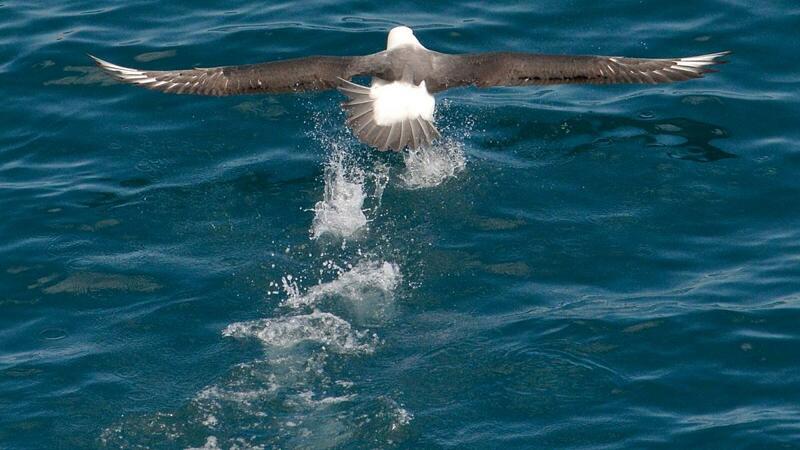 Depending on species, a 2.5 m or even 3.5 m wingspan is normal. And we were lucky enough to be there when a school of 30 long-finned pilot whales swam past, some of the juveniles jumping out of the water like dolphins. We completed three more camera tows, two on an unfished and one on a fished seamount. On the unfished seamount, we were fortunate that the transect came off the seamount and was heading towards the ridge of a caldera of a parasitic (or satellite) cone on the flank of the seamount. We continued the transect up and along the ridge of this caldera and again encountered deep-sea corals along the ridge away from the main seamount. This suggests again that there are more deep-sea corals in this area than had been previously thought. I look fwd to hearing details of this exciting mission.